Running with your dog leads to a stronger body for both you and your dog. Stronger Bones, Ligaments & Joints will give you and your dog a better quality of life. Not only will you both feel the benefits, but you will be able to see the results. Our fitness classes are progressive, the soft trails used reduces the impact that running on harder surfaces incur. It has been scientifically proven that intelligent training creates a body that is able to withstand degenerative and inactive issues. 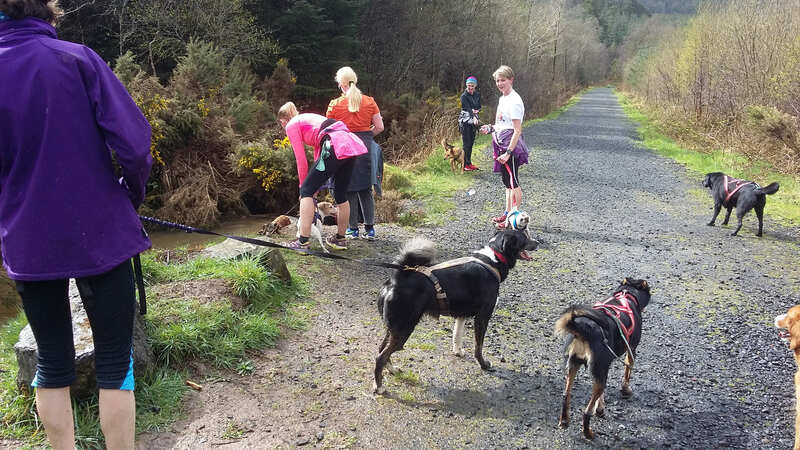 The Dog Trails team have extensive intense experience in various applications of producing a healthier body that can perform, but most importantly stay injury free, promoting a long and happier life. The Heart, Lungs and Circulatory System are extremely important for both Humans and Dogs. Canicross will provide ample amounts of exercise to stimulate the Cardiovascular system, keeping yourself and your dog in tiptop condition. Consistently exercising these vital functions will develop a strong Cardiovasular System, that not only can enable a faster run but more importantly will make the body more efficient at repairing, delivering nutrients and recovering faster from common illnesses. One of the things you will notice coming to classes is that your dog will sleep after class. They will be hungrier and more importantly content. You will notice when you go to work during the day that your dog is more content and less agitated. It is very important for us as responsible dog owners that we provide our dog with activities that release all the energy they have. This makes perfect sense when you think how active dogs should be. For 1000s of years dogs have worked with humans, helping us with various tasks using their endurance and willingness to be part of the human pack. It is only recently that dogs are becoming more sedentary. This produces many issues: behavioural, obesity, unhealthy and generally an agitated dog. You will notice your dog listens to you more. Dogs like having things to do, they like to please, be rewarded and to feel like they have a part to play in the pack. Have you ever noticed the dynamics of your dog, always watching, listening and wanting your attention. They are primed for working. Canicross provides this in abundance. The commands used for directional work, increased speed, or the simple act of encouragement provides this boost; enduring physical tiredness together. If you aren’t one for physical exercise, you may never have experienced the joy of becoming physically stronger. It trickles into every aspect of life. If you want to become more productive in life mentally, start by providing your body with the right stimulates to release the right chemicals and further produce a body that is less tired and can endure more. It will improve mood, confidence and focus. Your dog will feel better, more content, be in physically good condition and live a longer life with less medical issues further on. An hour of Canicross or an hour of walking your dog, which one provides more stimulation. Definitely Canicross, although it is also important for your dog to have off the lead time to relax and enjoy the simple sniffs. A 20 minute Canicross or bikejor session will tire your dog as if they were on a day trip. Dogs will become more stable when participating in Canicross due to the act of socialising them with other dogs. Their energy becomes focused on Canicross which leads to an excitement, if you have ever seen a Canicross race event you will know the excitement experienced by puppers ready to race. Reactive dogs can be socialised into the Canicross environment. We give reactive dogs space, overtime they will learn that Canicross is a good thing and that their classmates are not that bad. Ever wondered where all the dog lovers are. Come to Canicross classes and meet them. You will meet wonderful people that are a joy to be around. The people that come to our classes are animal lovers that want the best for their dog through nutrition, exercise and love. You do not need to be fit to join our classes, however we want you fit and we will make you fit if you come to us regularly. Having something to do, a hobby and routine is important. It will provide you and your dog a better quality of life long term. It will take time and it will be hard work. A year of Canicross training will see results for both yourself and your dog, you will learn things about yourself and about your dog. Your dog will be raring to go for a run to release energy. More importantly you will both be happier.